Lee Johnson is a productive member of the NRT earning recognition and acknowledgement from Bruce G. Zipf, President & CEO of the NRT. Mr. Zipf felt compelled to congratulate Lee on his exceptional quarterly performance results that puts Lee among the top half of the NRT’s distinguished Top 1,000 Sales Associates for the Fourth Quarter of 2015! 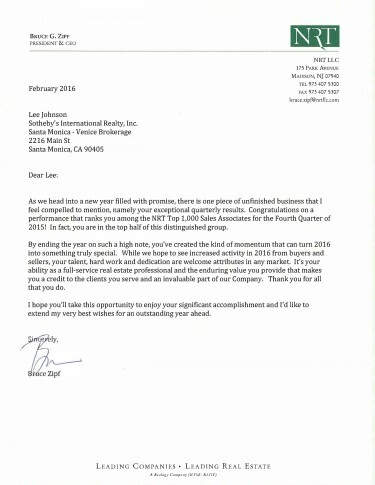 That acknowledgment means Lee Johnson is in the top 1% of the NRT’s over 47,000 Sales Associates nationwide.